Made of durable EPDM rubber. 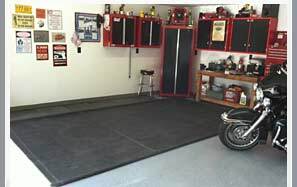 Protects garage floor from salt, slush, snow and sand. 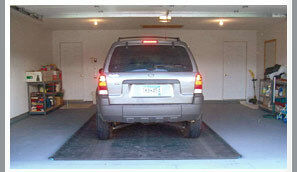 Keeps fluids contained so as not to damage items stored on your garage floor. Has a resiliant containment edge that will immediately return to its original state after it has been driven on. Constructed to contain 100+ gallons of fluid and debris. Fits simply under vehicle to catch the slush and melting snow that accumulates from your tires and under carriages. Eliminates tracking of road chemical residue into your home. 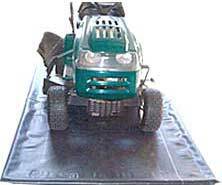 MATS FOR SPLATS can also aid as a barrier and help eliminate the transfer of moisture to your tires and rotors when vehicle is being stored on a cement floor that sweats. 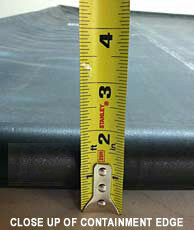 The rubber mat has a 1-1/2“ high resilient edge on three sides, and 2” at entrance edge. MATS FOR SPLATS stays in place if you choose to wet vac instead of brooming it out. "I'm amazed at the capacity of fluid that MATS FOR SPLATS can hold. I'm on the road a lot and don't have the time or ambition to broom it out every week or two. I've been able to go several weeks and broom the mat out at my convenience. Hibbing, Minnesota "To all the women out there... MATS FOR SPLATS is the answer to my prayers. No more nagging from my wife, no more tracking of sand, slush or mud into the house from the garage, no more water on my newly painted garage floor. 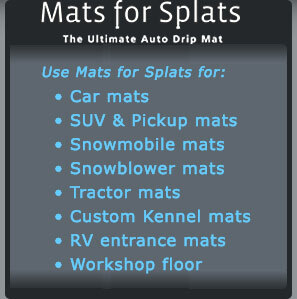 MATS FOR SPLATS is terrific, and is "Our family's" new best friend!"